Metal design? Check. Expandable storage? Check. All the most powerful internals? Check. On paper, the HTC One M9 is one beast of a phone. Though given that this is HTC’s fourth One phone, that name is starting to feel a bit like a misnomer. Even so, the HTC One M9 is a solid competitor in the high-end smartphone realm as it packs nearly everything you could want into a gorgeous package with minimal software tweaks. Read on to the end to see how you could win your very own HTC One M9. If you’ve ever seen an HTC One M8 or M7, you won’t be surprised much by the M9. HTC has once again gone with a full-metal body that’s thick in the center and gets thinner on the sides, allowing it to curve ergonomically and fit well in your hand. The HTC logo still sits at the bottom of the front on those big bezels, accompanied by the front-facing Boomsound speakers. The power button and and volume buttons are both on the right side. Since they’re all about equal-sized buttons (no volume rocker here), it’s very easy to get them mixed up when just feeling around your phone. I often tried locking or unlocking the One by pressing the volume down button, since it’s positioned about where the power button is on most other Android devices. The actual power button sits below it, and it feels just slightly too low — I had to readjust my grip a bit each time to press it. The power button is textured slightly differently to the volume buttons, but they’re still too similar. On the right side of the device, you’ll also find a little pop-out slot for the nanoSIM card. HTC’s user manual warns that you need to have a nanoSIM to use this device — not simply a cut down microSIM — because the cards themselves are physically thinner in addition to being smaller in width and length. The left side of the phone is nearly bare, aside from a pop-out slot for the microSD card, which can support up to 2TB of storage. That’s a ridiculous amount of expandable storage, but you’ll need to carry around the small metal tool for popping out the microSD card from the slot if you plan on changing it frequently. That’s the sacrifice that had to be made for such a beautiful metal design. Up top, you’ll find a long IR blaster for changing the channel on your TV, and along the bottom, you’ll find a microUSB charging port and the headphone jack. The top grill underneath the speaker is also home to a small LED that will blink yellow every 3 seconds when you have a notification, and glow orangeish red when charging. The body of the phone itself doesn’t seem completely unibody this time around, as it is distinctly a two-tone phone. My Gunmetal Grey version had a dark grey back and a lighter grey front, but the other Silver/Gold version has a gold front and silver back. It’s kind of a unique design element that certainly helps the M9 stand out while still looking great. Regardless, it’s certainly a sturdy and comfortable phone to hold, even if at 157g heavy and 9.61mm thick, it’s a bit heavier and thicker than its closest competitors like the 129g/6.8mm iPhone 6 or the 132g/6.9mm Samsung Galaxy S6. You also get a nice pair of free in-ear headphones in the box that are black with red tips. They’re not the most high-end of headphones, but they’re certainly better than the cheap ones you’d buy a drug store. I really enjoyed using them, and the built-in audio options for the headphones (which we’ll discuss later) made them even better. 5 inch panels seem to be the norm on smartphones nowadays, and while some manufacturers have chosen to go with 2K displays, others have decided to stick with 1080p, since 2K screens use more power and aren’t noticeably much better. The M9 falls into the 1080p group. The IPS display means that it has great viewing angles, and the very fact that it’s an LCD rather than an AMOLED makes it much easier to see in direct sunlight than competing phones like the Galaxy S6. However, LCDs do look less contrasted and a bit more washed out than AMOLED displays. Well, not exactly. 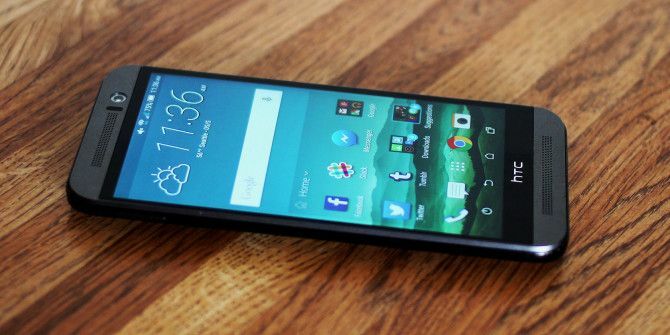 While they certainly put out better quality audio than other smartphone — like the Galaxy S6, ZTE Blade S6 (our review ZTE Blade S6 Review and Competition ZTE Blade S6 Review and Competition Read More ), or OnePlus One — they’re actually noticeably quieter. Whenever audio is playing, you get a persistent notification that tells you that the Dolby Audio is working in the background to improve the audio quality, whether it’s out of the headphones or the speakers. If listening via the speakers, you can choose “Theater Mode” or “Music Mode”. Theater sounds more immersive and surround, while Music sounds a bit louder and more direct to me. With headphones in, you can choose the kind of headphones that you’re using and it will tweak the audio slightly. Aside from the annoying persistent notification, I enjoyed this feature since it brought along better audio quality. Having ditched their back-facing Ultrapixel camera, the One M9 now has a sapphire-coated 20MP rear shooter that takes very good photos. The camera interface itself has been tweaked quite a bit, but it still looks nice and modern. You swipe across the screen to switch between modes that include Camera, Selfie, Panorama, and Bokeh, and there’s a settings menu for adjusting advanced settings like the ISO, exposure, and white balance. The bokeh effect allows for some cool burring of the background, and it did a relatively good job of differentiating the foreground from the background in my testing. The above photo was taken indoors on an overcast day with sunlight streaming in from the right. The front-facing camera, while only 4MP, is considered an Ultrapixel camera, meaning it uses larger pixels to capture more information than a typical 4MP camera. Theoretically, this should lead to better selfies. Generally, I thought the front-facing camera did a great job. It has a Live Makeup setting that you can adjust to make yourself look like your skin is a bit smoother than it really is — though if you crank it up all the way, you’ll look like a scary porcelain doll. The front-facing camera is also capable of shooting 1080p video and has other features like Auto Selfie and Voice-activated Selfie that are nice features to have. HTC’s Sense 7.0 is greatly dialed back from their past Android skins Android Skins Explained: How Do Hardware Makers Change Stock Android? Android Skins Explained: How Do Hardware Makers Change Stock Android? Hardware makers like to take Android and morph it into something that is entirely their own, but is this a good or a bad thing? Take a look and compare these different Android skins. Read More to the point where I actually like this one — for the most part. Let’s start with the homescreen. The homescreen by default has a large clock/weather widget at the top and a widget at the bottom that changes between Out, Home, and Work depending on your location. You can swipe to the left to access Blinkfeed, or swipe right to see more pages. Blinkfeed is a collection of news sources and social media tailored towards you. You can choose to sign in with Facebook, Twitter, Google+, or Tumblr — or you could just keep it narrowed down to whatever news sources you like to follow. The experience is extremely fluid and allows for quick switching between Blinkfeed and your other apps. Still, if you don’t like Blinkfeed or the general homecreen appearance, you could always try out a third-party launcher Which Android Launcher Should You Use? We Compare the Best! Which Android Launcher Should You Use? We Compare the Best! These awesome launchers will have your Android device feeling brand new. Read More . The notification shade is also a bit changed from stock Android, as shown below. Pulling down from the top once shows your notifications (left) and pulling down again shows your Quick Settings (right). Tapping on the time/date at the top toggles between these two views, which is unusual since it usually takes you to the Clock or Calendar app in stock Android. The Quick Settings have multiple options besides just toggle. The brightness has multiple modes, and any setting with the three dot icon can be tapped to take you to more advanced settings. The gear at the very top will take you to the system settings, and the notepad and pencil will allow you to edit which settings appear there. If you venture on over to the full settings menu, you’ll see it looks pretty classically HTC with lighter colors and squarer switches. Here, you’re able to change and personalize all sorts of things about your One M9. You can edit the navigation bar (see how mine has a screen-off button) or play around with HTC’s new theming app. Now those are some cute icons. You’re bound to find a theme you like buried somewhere in the relatively extensive theme store. This one is going to come down to personal preference, but it is nice to see HTC giving the user some options here. When on a phone call, everything looks pretty clean and modern. The only interface weirdness I ran into was the semi-green notification bar that appears when you multitask talking on the phone with someone. I’ve seen much more elegant ways of changing the notification bar on other versions of Android, and this one just looks it was left over from an older version and they forgot to update it. Adjusting your volume is very similar to stock 5.0 Android — there are None, Priority, and All settings for notifications — but there is one big difference: HTC added a true silent mode. As in, your phone can be completely on silent but still show LED notifications and still have alarms go off. This feature was taken away in stock Android 5.0 and left many people furious. And finally, HTC has added quite a few “Motion Launch” gestures to give you quicker access to certain aspects of your phone. I found these to be too convoluted to be useful, but maybe you’d appreciate the ability to open your camera by holding the volume button and lifting it horizontally. The only feature here I really liked and used regularly was the double-tap-to-wake, which has become a staple of Android phones as of recently. However, HTC’s implementation is subpar because it requires you to be holding the phone vertically — double-tapping the screen while it’s lying on a table will more than likely not work, which is frustrating. There’s also no double-tap-to-sleep either, so if you want to turn it off without pressing the power button, I suggest adding a screen-off button to your navigation bar. The unlocked M9 comes with a few preloaded apps, but you’re likely to get many more if you buy it from a carrier since carriers love to heap useless apps (known as bloatware, which you can sometimes get rid of What You Need to Know About Removing Android Bloatware What You Need to Know About Removing Android Bloatware Lots of phones come with annoying pre-installed software, but you can remove it. Here's how. Read More ) onto their devices. If you snag one unlocked, though, you’ll find it comes with: Peel Smart Remote, HTC Backup, a Photo Editor, HTC Print Studio, HTC Dot View, Zoe, Scribble, Car, Kids Mode, and POLARIS Office 5. POLARIS is a nice addition so that you can open Word documents on your phone. Scribble is a creative note-taking app that you may or may not enjoy (I prefer Google Keep 4 Google Keep Tips And Tricks For Better Notes, Lists And To-Dos 4 Google Keep Tips And Tricks For Better Notes, Lists And To-Dos Read More ). Zoe is HTC’s cute little video app that creates small montages of your photos and videos; it’s fun to play around with for a bit, but not particularly amazing. IR blasters on smartphones have been around for a while, and the Peel Smart Remote app takes advantage of that to allow you to control your TV (or really any TV you pass by) with your phone. HTC Dot View is only useful if you have one of the Dot View cases, and Print Studio is only useful if you have a compatible printer setup. HTC Backup and the Photo Editor are nice to have, though. The Photo Editor has some useful quick editing tools and the Backup can store your phone’s settings in case something happens to it. The Car app is useful for when you’re driving because it gives you a simplified interface with easy access to things like Google Maps and voice controls — it’s definitely a worthy dashboard car mode app The 5 Best Dashboard Car Mode Apps For Android Compared The 5 Best Dashboard Car Mode Apps For Android Compared Want a safe way to use your Android smartphone while driving? These car mode apps make it easy. Read More . Unfortunately, the Kids Mode doesn’t seem quite ready yet. Trying to open it only presents you with a toast notification telling you that an update will be coming soon. In the future, hopefully we’ll see an update that allows for the phone to be locked down into a specific kid-friendly app. I rarely experienced any lag at all on this device. No matter what I threw at it — games, YouTube, multitasking, phone calls — it handled it all with ease. The Snapdragon 810 powering this phone really is a beast. That said, it definitely got hot after just a few minutes of use doing something intensive like streaming YouTube or scrolling through an image-heavy Tumblr feed. The phone got uncomfortably hot to the point where I just had to put it down and give it a break. Still, the times when it got that hot were rare, and overall, you won’t have to worry about performance issues here. Flagship lines have never had best-of-class batteries — for that, you had to go to a specialized phone like the BLU Studio Energy (our review BLU Studio Energy Review and Giveaway BLU Studio Energy Review and Giveaway For only $150, the BLU Studio Energy packs a massive 5,000mAH battery that lasts for days - but is it more than just a huge battery? Read More ). The One M9 certainly doesn’t get to breakthrough levels of battery life like the BLU, but it’s much better than average. With light to medium usage, it would make it to the end of the day with 50% or more battery left. That’s impressive considering most other phones drop down to 20% or 30% by that time even if they’re not being used much. I would send messages on Facebook Messenger and Google a few questions, but nothing super intense. With heavier usage I could definitely bring it down to 15% by the end of the day, but at that point I was really trying to kill the battery by scrolling through Tumblr a lot in my spare time and just generally using the phone more. The annoying thing about the battery interface in HTC’s Sense, however, is that you can’t view your screen-on time, so I couldn’t tell you exactly how much screen-on time I was getting. If I had to guess, though, I’d say 4-5 hours of average screen-on time per day, which is really quite good. One cool perk that comes free with the One M9 that’s new to me is the HTC Uh-Oh Protection. If you sign up for it (which can be done via Facebook, Google+, or email), they’ll replace your phone if it dies within the first year — even from a cracked screen or water damage! Given the amount of people I see every day who live with cracked smartphone screens, and the amount of horror stories I’ve heard of people dropping their phones in toilets or puddles, this should really be a great service for many. If you’re prone to damaging phones, then the Uh-Oh Protection might just be a major deciding factor for you. Though it can be much cheaper to buy unlocked smartphones Never Buy a Phone From Your Carrier! Buy Unlocked Phones and Save Hundreds Never Buy a Phone From Your Carrier! Buy Unlocked Phones and Save Hundreds Unlocked phones can cost a fortune, but the savings more than make up for it. You can save thousands by not signing a contract. We've got six phones that come contract free! Read More , many people still stay in 2-year contract agreements for one reason or another. If you’re one of those people, the HTC One M9 is a solid choice for your next smartphone. It’s refined, sturdy, fast, and it has good battery life. You might want to look elsewhere for the loudest speakers on the market or a cheaper off-contract phone (like the OnePlus One Top Six Best Features Of The OnePlus One -- And One Drawback Top Six Best Features Of The OnePlus One -- And One Drawback I've been living with the OnePlus One for a few weeks now, and it's amazing, but it's not perfect. Let's run through some of the best features -- and one downside. Read More ), but otherwise the One M9 is a great choice. I WILL MAKEUSEOF THIS PHONE YOUR OFFERING. I did all the entries I could. Pinterest is blocking the pin though. Claiming it's spam. I am back and I am interested, loving this contest. Well I broke down and had to buy a phone but still would love to win for my husband cause hes locked in with his HTC one. and it crapped out on him. I would love to win this, my phone is still shattered. I can not break down and buy another. So sad right now. Please send me luck to win this. Entered, but you might want to check some issues with the entry process. : 1. Pinterest would not let me pin the picture, as their error said it might lead to spam. 2. Almost all the Google+ entries in the Gleam widget makes the page reset back to the top of the page "Home" position when the entry is made. It doesn't happen with other entries, like Twitter, Facebook, etc. It's a bit annoying. I'm experiencing these problems on the latest version of Chrome on a Win 7 SP-1 32-bit PC. My son was just telling me today that I need a new phone, my current phone no longer receives updates...I really like this one and all its features...fingers crossed!!! I want to WIN this HTC because I need a smartphone. The price is too high, is more than a half of monthly pay of some people, and for students like me is just too much. Good luck to everyone!!!! Ok, I keep saying I want to win this for my husband but as of today I shattered my phone. I now would LOVE TO WIN THIS HTC!!! I've always said that the HTC One is the best phone on the market. This proves it. My husband has the first phone of htc, I would love to see the advanced changes. Awesome phone. But a little bit expensive. For that price I will go for an iPhone. Cool looking phone - Would love one ! It looks like a great phone to have! Even if it does dishes, walks the dog and keeps you warm at night, no phone is worth $649. No phone. Come on, IT'S A PHONE! Even $199 is too much for any phone, even this one. If consumers wouldn't pay these gouging prices, phones wouldn't cost $200!! (Besides, none of the contract carriers mentioned deserve anyone's business; had them all--will never return. Superior, more user friendly providers are readily available.) Same with the cell service fees; if everyone disconnected, prices would plummet. One of best phones (it is about reception and call quality isn't it?) I ever had was an LG 3G that was stolen. It cost $69 and way out performed the eight phones purchased since , including two iPhones. (It must have been an manufacturing error because days after my purchase, it was discontinued.) No LG tried since has come close. Cell phones should be treated as the disposable item that they really are. Use 'em and toss 'em. Would you pay $699 for paper towels? Me either. If any of the gouger companies cited wants my business, the phone had better be gratis (the original Ma Bell had that right) and the fee for unlimited use better be about half what they charge now for limited basic. External number blocking is an absolute must. An Aside: Operator/owners should have the ability to turn off the GPS tracking and completely defeat the audio and camera when desired. Otherwise your cell is a spy machine for its carrier, the government (and numerous others too) and any hacker, foreign or domestic. Wow, what a nice fone, not a ton of CRAPWARE either, so sick of crapware. Boy oh boy, do I want one of these! My Huawei H868C is about one of the most useless pieces of crap I've ever owned. Please, Android gods, let me win it!!! Looks like a phone that does everything right! I would expect no less from an HTC flagship. Those front-facing speakers are hard to beat honestly, so I imagine HTC will be my go-to brand for any friend that asks me to find a high-end phone for them. I still have my htc one x and use it as my daily driver, i hope i win this gem! I would like to win this phone cause my phone has been acting up on me. Id would like to win this and give to my husband. Why can't I pin the picture in the giveaway? Blocks, saying spam? Hell of a phone here. Too bad everybody is flocking to the S6 and killing HTC's quarter. No doubt, their next flagship will try to reinvent the wheel and fail as a result. Some of us still love you, HTC, keep on trucking! Only way of earning the HTC One M9 .. fingers crossed but sorry guys i just hope i win because this is actually my favorite phone. Sounds like it would be the perfect replacement for my RazrM! Great review, would love to dump my PadFone x for this one. I didn't see any mention if the screen was scratch resistant or gorilla glass. This sounds like a nice upgrade from my current LG G2. Stupendous and concise review Justin, hope to win the giveaway. Adieu! Count me in. A great review makes this item well worth buying..... or winning.